I got this fantastic email from our Far and Away friend in the Philippines, who wanted to talk some more bow. 1) if the pinky is curling, then the bow has the tendency to fold towards the palm of the hand. This creates cramps in the thumb joint and wrist and instability. 2) if the pinky straightens on the top of the stick, then there’s tension there, which is never good, and again with wrist pain. When I look at his hand, I see the thumbnail nearly perpendicular to the floor. Sometimes students try to get more of that thumb’s surface area in the crook of the frog to get a better grip. In fact, the bow doesn’t need to be gripped at all. The thumb is much more of a fulcrum than a pincer, but it is so tough, especially for young students, to believe that it requires less pressure than even holding a pencil. To start a little bit of deprogramming, go back to this post, and do the exercise where you try and pull the bow off of the string as he keeps it on. If that doesn’t get him rotating, then let’s do the Bow Slam. Oh yes. The Bow Slam. 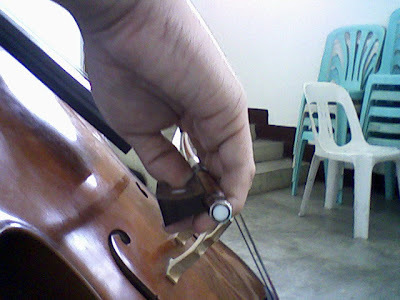 Keeping the shoulders neutral, take the bow out to the tip, and have it hover about 6 inches above the D string. In a singular movement, turn your wrist towards your index finger and slam the bow down onto the string, trying for no bounces when you make contact. The more aggressively the hand turns onto the index finger, the easier it will be. 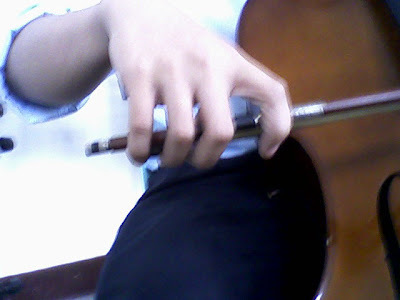 I find that the some of the most powerful tone I get is with the least fingers on the bow, due to that rotation. It also has a way of preserving the sanctity of the arm’s motion. There should be a long line from the shoulder, through the elbow, then the arm drops from the elbow so that the wrist is slightly lower, through the flat, loose wrist and onto easy, draped fingers. Then the motion of the arm is simply telegraphed to the hand. The last thing I want to mention is the bend in the wrist in the second picture. BIG red flag there. Sure, the wrist needs to be flexible, but the angle I see there puts huge strain on the wrist and sort of ruins any fluidity that the arm might offer to the hand. Check out this little diagram from Terry’s blog. I think it shows the general concept well, and if you can get Lyndon’s arm following that track, with just a negligible amount of curve at the frog, that would be a good start. Hope this is helpful, and we look forward to hearing what happens!